The world of sake, the Japanese rice wine, extends beyond just what you can drink. It is social experience and a way of meeting people. In this VR photo essay I will take you to a few such experiences that take place every year. Get a good taste by putting on your VR googles, or simply use you finger or mouse to rotate the image. 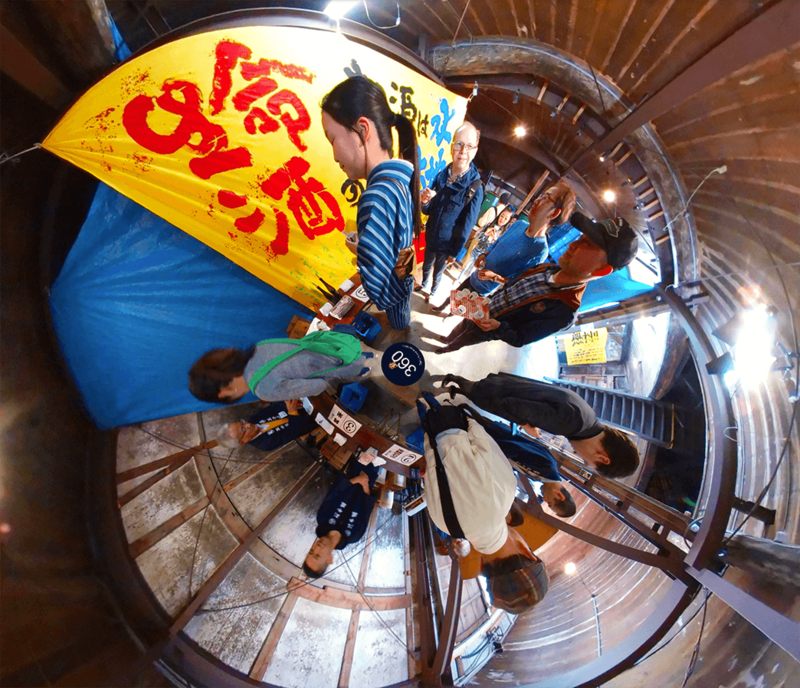 Step into Tajimi using your VR goggles! 1. Click on the button to copy the url of this page. 2. Open a compatible browser. Use your finger to paste the URL in the browser address bar and open the page. Tap the goggles button in the image and set the phone in your goggles. The Michisakari Sake brewery in Kasahara, Tajimi, holds a very popular sake tasting event every year. We were blessed with great weather - this is a pleasant time of the year here. As you can see, people were in a very good mood as well! I tried out my ten shots of sake for the very reasonable price of 500 yen (About 4.7 dollars). The price doubles for the best brands. The 2018 event was held on March 25. Directions here. ​A guided tour of the Michisakari Sake Brewery, Kasahara, Tajimi. ​The always happy Tamaki-san sells the best Tono brands of sake in his cozy store in Tajimi. Sometimes he throws a jazz music party here. This day he exhibited Mino ware flasks and cups in the shop. Don't forget to look up at the ceiling. Pleasant! ​Happy ladies at a sake tasting party by the Tajimi station. ​The MeetsTono party under the Nagoya Television Tower. You can bring home a nice Mino ware sake cup, so pen it into your calendar. The 2018 party was held March 16 - 18.